Digital 1945-2130 President Bush: G8 Working Dinner. Ocean Forest. Sea Island, Georgia. G8 Summit Official Photography (Class or Family) on the Beach. 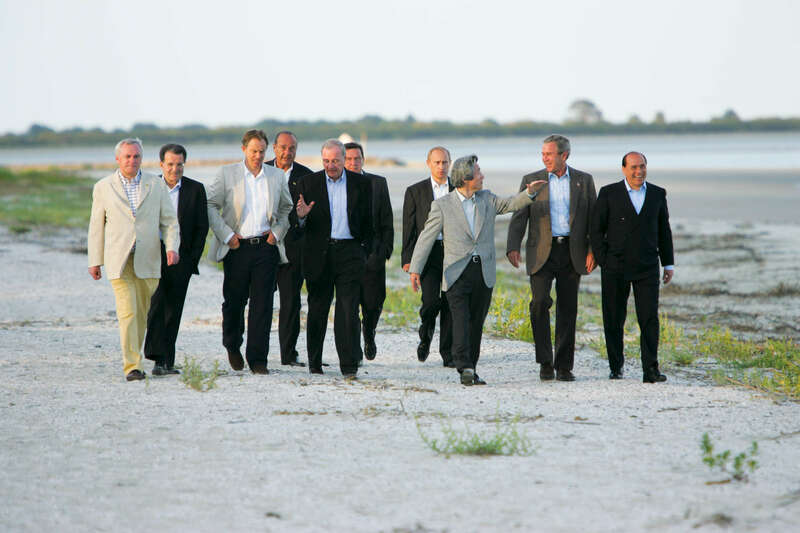 Leaders: President Bush, United States; Prime Minister Tony Blair, Great Britain; President Vladimir Putin, Russia; Chancellor Gerhard Schroeder, Germany; Prime Minister Silvio Berlusconi, Italy; Prime Minister Bertie Ahern, EU, Ireland; President Romano Prodi, European Commission (EC); Prime Minister Paul Martin, Canada; Prime Minister Junichiro Koizumi, Japan; President Jacques Chirac, France. Released to G8 for possible use in a book.